In 2003, Mark started conducting formal scientific research on two species of Australian native stingless bees, Tetragonula carbonaria and Austroplebeia australis. In these studies, he hypothesised that the bees would successfully pollinate crops inside greenhouses, and results proved this not only to be true, but that they improved crop production by up to 24%. His next hypothesis was that long-term confinement inside greenhouses would not have a detrimental effect on the health and durability of these species. However, he was faced with problematic hive observation methodologies that involved physically opening the boxes to roughly estimate brood health and size, volume of honey, pollen and wax. This invasive process not only spilled honey and ruined wax structures, but it also killed many of the 3.5mm-sized bees. Above all, it was not going to enable an accurate indication of colony health. Formerly a diagnostic radiographer, Mark proposed an innovative, non-invasive way to observe colony health in stingless bees, using CT. Traditionally used in human medicine, CT scanners consist of an X-ray tube that rotates around a body moving consistently on a straight plain. X-rays are received by a detector on the opposite side of the body and an image of the scan is produced by a computer. Images from the very first scans of the native bee hives were both informative and visually stunning. They provided useful, accurate information about honey, wax and pollen volumes, and allowed for the non-invasive measurement of brood volume, which was an important break-through. 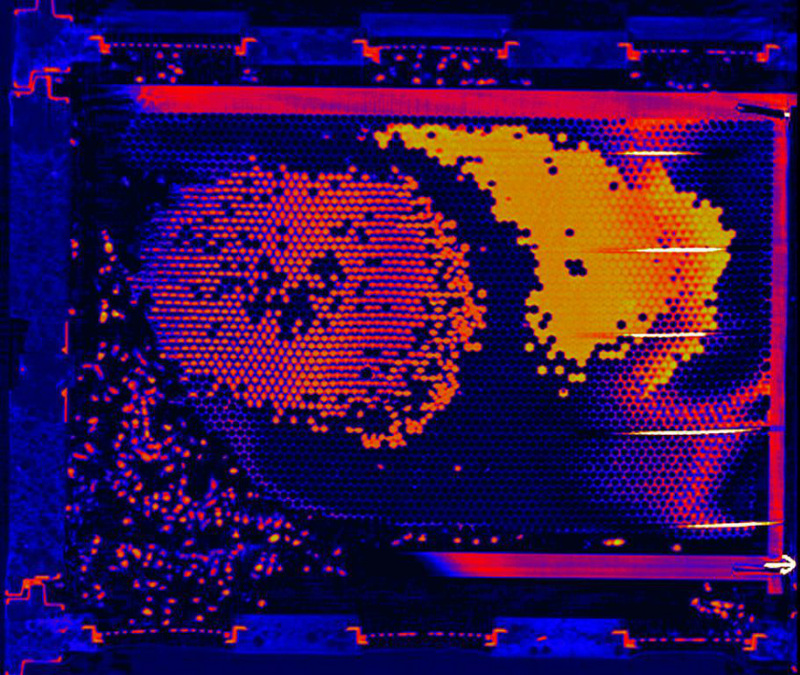 Scans can produce impressively detailed images for observing bee behaviour. Although standard glass sided observation hives continue to be valuable for comb surface observation experiments, DR enables new, 3D observations of bee behaviour within a normally functioning hive. Importantly, it shows previously unseen structural changes which occur deep inside a full-size hive while all the frames are in place. This image shows vertical foundation wax (green), cell wax (blue) and honey (white). At the bottom right, two workers are inspecting or cleaning out the base of the cells. There’s also one worker bee (red cross on abdomen) that has its proboscis extended and shows evidence of honey in its abdomen. If required, this bee’s behaviour can be observed over time, by marking it and repeating scans. As research continued on internal observation of hives, Mark attempted non-invasive ways to observe the internal parts of the bees themselves. By putting them in a MicroCT scanner, he was able to observe the internal morphology of live or dead bees. By using radiation doses that are of a safe level for insects, for the first time, researchers can now also conduct physiological experiments on live, individual bees, without harming them. This approach is currently being used to observe individual, infected bees over time, with repeated scans enabling the course of disease to be accurately tracked. This method will reduce the inherent errors that occur when trying to observe the course of infection across many different individual bees. DR has opened the door for many other applications, such as non-invasive observations of other bee pollinators such as bumble bees Bombus terrestris or solitary bees such as the various Amegilla species that are managed in artificial nests. The nests of soil or wood dwelling bees have been particularly difficult to study in the past and many nests required complete removal and destruction to conduct full observation experiments. If required, nest architecture and bee behaviour experiments in these managed species can now be conducted without disturbing hive structures and nests can be returned to the environment unharmed. DR can also be conducted on valuable specimens such as museum collections or insects﻿ trapped in amber or stone without damaging them. One example of this is in practise, a previously un-described species, Proplebeia abdita, was discovered after scanning a piece of amber approximately 20 million years old. In near-perfect condition, the bee was studied without damaging the amber, which also contains other inclusions that can be re-examined. “I have observed winter cluster behaviour deep inside the cluster and in-hive honey distribution patterns that are different to the current thinking”. Up until now, there have not been any accurate methods for measuring how much honey, wax, pollen or bees are in a honeybee hive without pulling it apart and even then, the results are still just estimates. Estimates are OK for beekeeping purposes however, with the current stresses on our bees creating colony losses, experiments to determine the upper and lower thresholds of food stores and pathogen loads require more accurate results. Although the results from scanning live colonies give great visual details of normal in-hive behaviour and nest architecture, scanning the entire colony and digitising the results also means that we can now accurately measure in-hive component volumes and population dynamics non-invasively. The greatest limitations to DR lie in the values for the hive component volumes, which can overlap and result in similar errors to the current estimation techniques. Also, assessing bee numbers accurately becomes quite difficult because the bees move. These movements can also create visual distortions to the image quality. Mathematics and engineering colleagues at the University of Bath are busy working on solutions to these problems using motion correction algorithms and tissue differentiation programmes. So, although it is already useful for most insects and their colonies, there is truly great potential for DR to be used as a valuable tool in bee morphology, physiology and behavioural research. This image shows an indication of what we can expect from research on in-hive components such as sealed vs unsealed brood and pollen, wax and honey volumes. 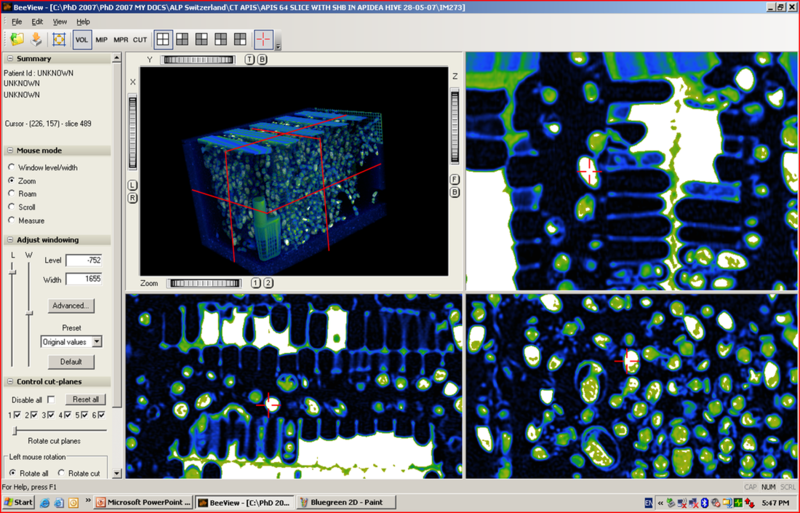 These visual images can be digitised and then the different hive component volumes and their respective ratios can be calculated. Once calculated, the volumes can be compared in longitudinal studies, or across sick and healthy colonies, or even across colonies with different food resources.